It's always a great time to enjoy a weekend trip to Myrtle Beach! March is right around the corner and each day the weather is getting a little warmer. Even better, St. Patrick's Day falls on Sunday, March 17th this year, giving you the perfect excuse to pack your bags, book a great Myrtle Beach condo with Beach Vacations and come join us for fun and festivities celebrating all things Irish all weekend long! Myrtle Beach will host plenty of great St. Patrick's Day celebrations, so reserve your Myrtle Beach vacation rental today and check out some of these awesome options during your getaway. And don't forget to wear green or you might get pinched! The area's longest-running St. Patrick's Day celebration takes place on Saturday, March 16th with the North Myrtle Beach St. Patrick's Day Parade. Kicking off at 9 AM rain or shine, the parade route runs down Main Street through the heart of North Myrtle Beach. This fun-filled event draws nearly 30,000 spectators annually. Following the parade, three stages will host live music and entertainment, while approximately 150 vendors will showcase arts and crafts as well as traditional Irish food and drink. The festival will also feature a kids area with amusement rides and games to keep them entertained. The festival area is open from 11AM to 4PM. One of Myrtle Beach's most popular St Patrick's Day celebrations, Irish Fest returns to the Market Common on Saturday, March 16th. This huge all-day festival runs from 11AM to 7PM with live music, amazing food, craft beer, family entertainment, and MORE! Kids will love the great family-friendly activities including face painting and inflatables and adults are sure to love the great food and beer vendors and wide selection of souvenirs and arts and crafts. Not to mention, the fun continues on Sunday, March 17th from 12PM to 6PM! Finally one of Myrtle Beach's favorite St. Patrick's Day events is returning to Ocean Boulevard this year! This weekend long event features green beer and great times for everyone! The festival will begin on Saturday March, 16th at 12PM at Burrough & Chapin Pavilion Place and run until 8PM. Then, the fun starts back up on Sunday from 12PM to 6PM! With so much fun packed into St. Patrick's Day weekend it's sure to be the perfect time to take a weekend trip to Myrtle Beach! And you don't need the luck of the Irish to get a great deal. Just visit any of Beach Vacations' sister property websites for amazing deals on the best Myrtle Beach condos for your getaway! 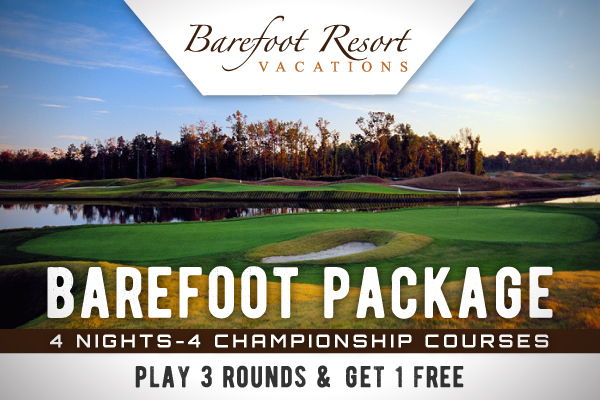 Barefoot Resort - Play 3, Get 1 FREE!